Blackadder lost another alumna of the series last week, when actress Patsy Byrne who played the foolishly lovable "Nursie" died on June 17th just two weeks after the death of Rik Mayall who played Lord Flashheart. Byrne and Mayall were both in the second Blackadder series and shared some humorous moments as their characters flirted outrageously with one another. It was Byrne's on-screen rapport with "Queenie" played by Miranda Richardson though that really caught on with viewers. They were the perfect double act. "Nursie" wasn't the first time Byrne had played a Tudor nurse. In 1976 she performed the role of The Nurse in a television film version of Shakespeare's classic Romeo & Juliet and the Blackadder writers actually modeled Nursie on that character. Performing in the classics was what Byrne, the only daughter of a railway engineer, trained for at Rose Bruford College. 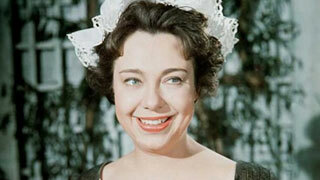 First though she did a stint in 1955 as a stage manager, before going into repertory theatre as an actress. By the early 1960s Byrne was a member of The Royal Shakespeare Company where her roles included Audrey in As You Like It and Maria in Twelfth Night. It was while touring with the RSC in 1964 that Byrne met her future husband Patrick Seccombe, who was the British Council representative in Uruguay. After Seccombe was posted to Finland in 1967, the couple got married and Byrne became stepmother to Seccombe's six children. The couple didn't return to the U.K. until 1970 and from then on Byrne's main acting focus was television work. 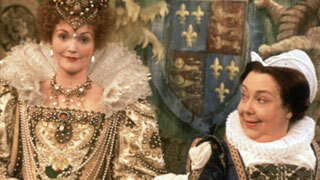 Byrne as Nursie, with Miranda Richardson as Queen Elizabeth I in Blackadder. Most of the work she got was in costume dramas. 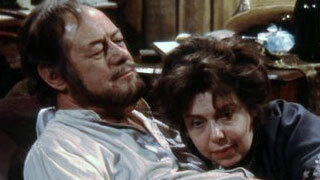 They included a 1971 BBC adaptation of Chekhov's play Platonov where she starred alongside Rex Harrison, The Old Curiosity Shop in 1979, Les Miserables in 1998 and David Copperfield in 1999. You might also have seen Byrne in the 1976 television production I, Claudius and in other series that aired on MPT such as Inspector Morse, All Creatures Great and Small, and The Ruth Rendell Mysteries. Byrne with Rex Harrison in 1971. One of Byrne's biggest talents was her ability to do accents and although many of her television roles were done with a specific dialect in real life she surprised people: Byrne was very well spoken. 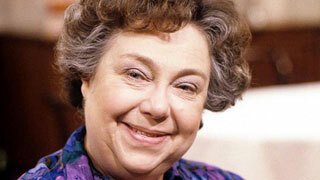 One of Byrne's last stage roles was in 1993 when she played Madame Arcati in Blithe Spirit. Byrne and her husband were married for 30 years until his death in 2000. Byrne never remarried and would later move into Denville Hall, a care home for the elderly, which is where Byrne died just two weeks short of her 81st birthday.